Water features enhance the overall visual appeal of your outdoor living areas and bring the tranquility of flowing water into your gardens and entertaining spaces. Lighting water features, such as ponds, natural swimming pools, fountains, streams and waterfalls, can turn even a relatively simple feature into an interesting focal point and can make your water features even more beautiful at night than they are during the day. This is particularly important if you and your family spend time outdoors in the evening or if you often entertain after dark. And, of course, it becomes even more important in fall and winter when the shorter days make all forms of landscape lighting more of a necessity. External and underwater lighting that illuminates both the structure of your water features and the water allows for greater drama between light and shadow, creates visual interest and movement, gives your outdoor living areas more dimension at night, and can be used to accentuate interesting trees, plants, statuary or architectural features to create a more appealing overall look. When it comes to how to light water features, an outdoor lighting designer can assist you in choosing the correct fixtures for your installation and in creating a lighting design that harmonizes with your overall landscape lighting plan and avoids the creation of dark spaces and voids. Whether you choose to work with a professional lighting installer or to take this on as a do-it-yourself project, there are many things to consider when lighting water features. Use this list of 15 tips and things to consider to help you achieve the desired effect for your yard. 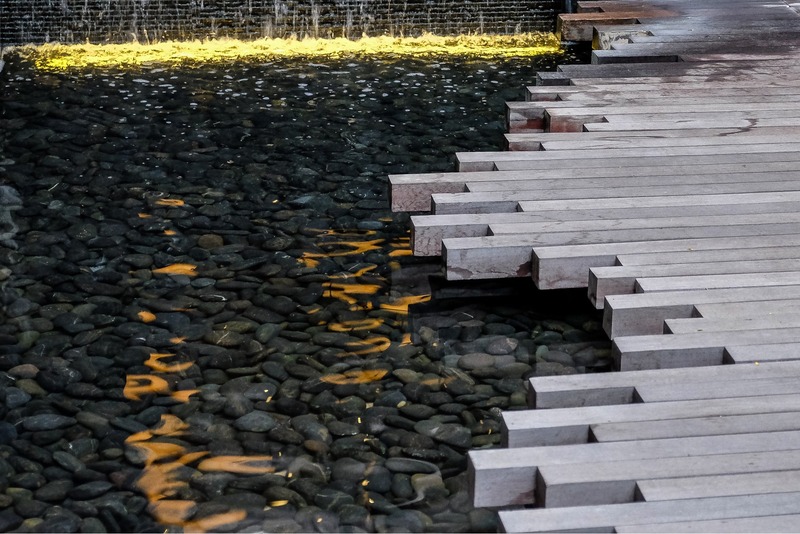 Considering the angle of illumination is an important part of water feature lighting. Primarily, this is because you want to use your lighting for accenting particular features or enhancing the play of the water on nearby objects, but you do not want a glare on the water from external lights or a blinding beam of light coming from your water features towards seating areas or outdoor living areas. So be sure to angle your lights away from the main viewing positions from the best results. Keep in mind that there may be more than one prominent viewing area if you have multiple entertaining areas, seating areas or walking paths. You can also use rocks, plants and other landscaping features to shield the light from shining directly towards viewing positions. You want your guests to enjoy the light display and ambiance of underwater lighting without seeing the mechanics, so work with your outdoor lighting designer to place the fixtures for optimal illumination while hiding the fixtures as much as possible. On a more practical level, you will also want to place your outdoor lighting fixtures so that they are easily accessible for regular cleaning and maintenance, such as removing algae and replacing bulbs (although you will not have to change bulbs very often if you opt for LED lights). You will likely need to have a transformer somewhat near your water feature but, again, this is something that you do not want to look at or have your guests see while enjoying your outdoor living areas. Therefore, do what you can to locate the transformer where it will not be seen. You may be able to hide it behind a plant or rock that blocks the view from the main viewing positions. If you are lighting a water feature that does not have fish, plants or other aquatic life, you have more freedom with the type of lighting and the position of your lights. If your pond or other water feature has plants or animals, it is important that you let your pond lighting installer know this. This will help him or her choose the right light fixtures and lighting design for your installation. This includes choosing fixtures that are not toxic to wildlife (copper is often used, but is toxic to fish) and choosing LED lights that do not give off heat to change the water temperature. Lighting areas where your fish swim can create a beautiful display for you and your guests to enjoy, but be sure to leave dark spaces as well where your fish can be out of the light and feel less exposed in a more tranquil space, if they so choose. One consideration you will need to make during the design process is whether you want to use external lighting to illuminate your water feature or underwater lighting to illuminate the feature from within. In most cases, a combination or underwater lighting and external landscape lighting will provide the most satisfactory outcome. This will require different types of light fixtures, so it is even more important to work with a professional installer to ensure proper fixture choice and installation. For external lights, you can use downlights from nearby trees or a deck railing or lights placed at ground level around the border of your water feature. Submersible waterscape lighting allows you to illuminate interesting features from below and casts a beautiful underwater glow that enhances the overall visual appeal of your water feature. Underwater lighting is also key to creating displays of refracted light that dance on walls, ceilings or other structures with the movement of the water. When designing your light plan, keep in mind that underwater lighting requires more maintenance than external lighting and that there is usually more effort involved in performing that maintenance. Underwater lighting is also usually more expensive to install than external light fixtures. Before you can design your waterscape lighting, you need to know the mood you want to create. In most cases, people want to enhance the relaxing, tranquil feel of gardens and outdoor living areas with calming, white lights that glow under the water and accentuate particular features. However, you may not be looking for a relaxing retreat and might prefer a lively, eclectic ambiance for an upbeat, party atmosphere. In this case, you may want to go with colored lighting or lights that change colors either at regular intervals or in conjunction with your sound system. In fact, with the right equipment and software, you can create a brilliant light display that will engage your guests with a water and light show. It is always easier to install underwater lighting while the water feature is being installed. This allows you to include the lighting in the overall design of the project, to more easily hide wires and fixtures, to have more freedom in light fixture placement, to avoid dismantling all or part of the water feature, and to avoid wasting water by needing to partially or completely drain the feature to install the lights. However, this does not at all mean that you cannot install underwater lights long after your water feature is finished. In fact – particularly for homeowners who do not work with professional landscape or waterscape designers – it is common to not realize you want (or need) lights until after the water feature is installed. You may not recognize the need for lighting until you see how the water feature disappears into the darkness or loses its visual appeal at night. Water feature lighting, particularly with natural swimming pool lights or pond lighting, is not only about enhancing the look of the feature; it is also about safety. Ponds and other bodies of water can be nearly invisible on a dark night, which can be a hazard for children or guests moving through your yard. Adding pathway lights along walkways that border your water features lets your guests know where they are and helps to safely guide them around the area. You can also use uplights to illuminate a bridge or flood lights to broadly illuminate a large area. The deeper your lights are placed under the water, the more diffuse the beam becomes and the wider the beam spreads. This could either work towards or against the overall look you are hoping to achieve. You may need to experiment with light fixture placement to achieve the desired effect. A professional landscape lighting installer with experience installing underwater lighting will be able to help you make decisions about the right depth for fixture placement, as well as the correct wattage to make up for illumination lost from submersion. Water feature lighting tips for illuminating waterfalls usually include recommendations for lighting the cascading water from the bottom, side or front of the waterfall. This enhances the movement of the light and the beauty and tranquility of the falling water. Avoid lighting waterfalls from behind if this will direct the light towards the main viewing positions. 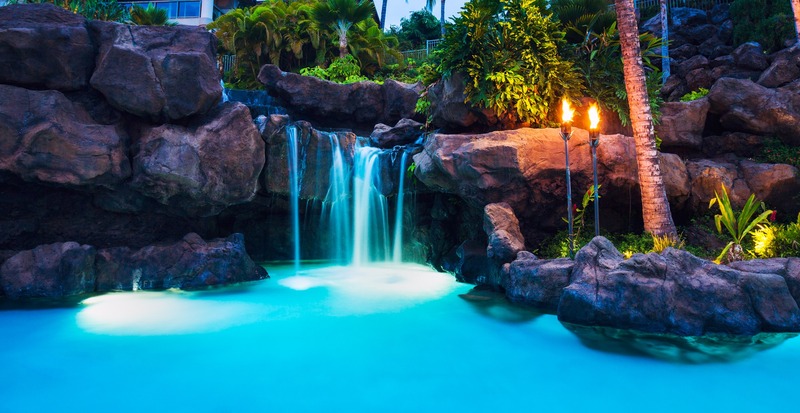 It is particularly important to illuminate the area where the cascading water comes into the pool at the bottom of the waterfall. This is the area with the most movement and drama. Aside from the above-mentioned pond lighting tips that include accommodating plants and animals in your pond and the considerations for the depth at which you place your light fixtures, one main tip for lighting a pond is that the light fixtures should not be seen. As previously mentioned, underwater light fixtures should always be hidden as much as possible, but this is particularly important when lighting ponds, because you want the light to look as though it is emanating from the depths of the pond. The main consideration when lighting fountains is whether you want to light them from under the water or with external landscape lighting. This usually depends on the size and style of the fountain. It is possible to use either of these options to enhance the visual appeal of the fountain at night, so work with your outdoor lighting designer to determine which option is best for your project. When choosing waterscape lighting, you will be most likely be choosing between halogen lights and LED lights. There are some solar options, such as floating lights for ponds and swimming pools, but those are simple, DIY lights that you can just add at a whim, if desired. When installing lights, you will be choosing between halogen and LED. LED underwater lighting will have a higher upfront cost than halogen underwater lighting in most cases. However, LED lights use less energy and are longer lasting, which means they will save you money on your energy bill each month and will save you more money over time than halogen lights. Just like many waterfalls and other water features, underwater lighting can be controlled remotely, which allows you to turn on your outdoor lighting from inside the house while you are preparing for your party or to change the color or other aspects of your lighting display throughout the night. While this is not a necessary feature, it is quite convenient. The concept of less is more is relevant to general outdoor lighting design, but it is particularly important when lighting water features. 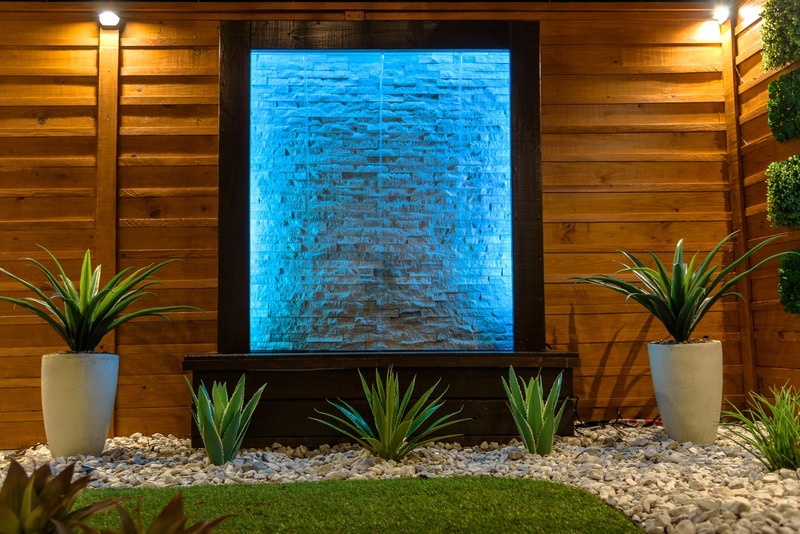 Too much light coming from under the water can blind your guests and significantly reduce the visual appeal of your water feature, while too much external light can cause a glare on the water much to the same effect. When illuminating water features, the goal is to create visual interest and movement, which is best achieved with well-placed lights that accentuate interesting features and highlight the movement of the water without overwhelming the area with excess light.